According to the Federation for American Immigration Reform, protecting the U.S.-Mexican border is, by far, one of the greatest challenges facing the nation today. Enforcing our border control laws are the brave men and women of the U.S. Border Patrol. Now is your chance to show your support for the U.S. Border Patrol agents and officers. 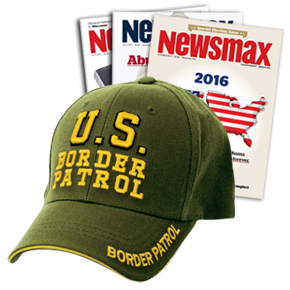 You can stand on the front lines of America's battle with illegal immigration by wearing the U.S. Border Patrol Cap. The U.S. Border Patrol is the thin green line of officers who protect America's borders. They struggle to do their job with fewer resources than any similar service in the world. They guard the 6,000 miles of our border with one-tenth as many people as are in the New York City police department. They stand alone. More than 1,000 U.S. Border Patrol agents have been killed or wounded protecting America. Now you can stand with them by wearing the U.S. Border Patrol Cap and send a message to your friends and neighbors that you too believe America should have safe and secure borders. Wear this cap with tremendous pride and show your friends and neighbors that you support the U.S. Border Patrol and that you believe America should remain steadfast in its never-ending battle to protect our borders. Cap is only available in XL size.